What is decision making ? . In sport, when an athlete decides to play/act in particular way. It can be passing the ball to certain position, hitting the ball in certain area, bowling certain length, playing certain shots. All these act are based on three points below. Skills/Technique – what is a skills?. An act that constitutes execution. It can be either with the bat or with a ball, either for a batsman, bowler or fielder. At a very early age one learns basics of all skills. As they climb the ladder of their profession they imbibe few more. E.g every cricketer knows how to play a defensive shot, or a cover drive, or bowl a off stump/middle stump line and as well length. They hone these skills as they progress. These skills need to be practiced on a regular basis. Cricket has variety of skills, and one can cannot stop learning. Encompasses bowlers, fielders and batsmen. E.g Tillakarantne Dilshan must not have learned how to play the scoop paddle when he started his first class career, but advent of T20 made him learn this skill. 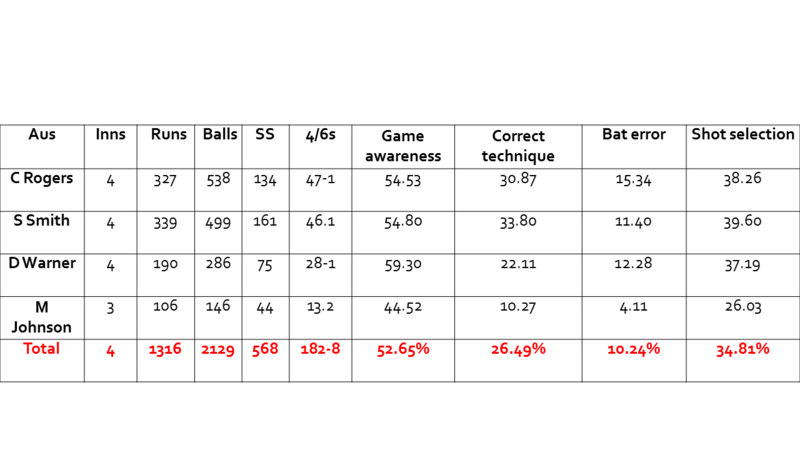 Shot selection: It is based on your skill/technique, game awareness and how played his previous delivery!. I believe muscle memory would help him recollect most of non-playing deliveries and his best shot selection. Yet it is how he adapts to the ones he was weaker to, and whether he is able to adapt and covert into scoring shot. A point is given for scoring a run provided his technique/skill is >50.00% - otherwise no points for edges, top edges, miscued shots, under edges, and other shots that could have cost batsman his wicket. Various players have different technique-and tail enders need to be considered as batsmen with limited technique, yet if they are able to fulfill their skills as a batsman and keep all the above in mind, than a point is rewarded. At the end of an innings these points are divided by number of balls faced or bowled. 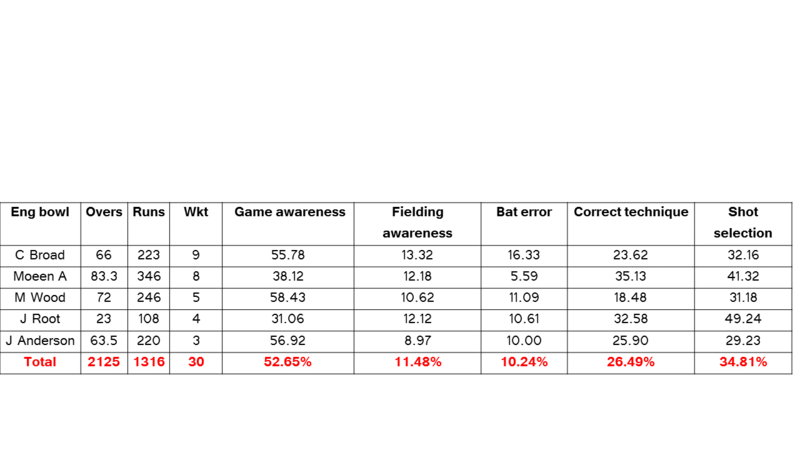 The points given for game awareness is slightly tricky as it gets subjective and debatable, especially when you are rewarding points to batsmen. Although first class cricketers are trained professional, yet it is very difficult for them to be aware of the game all the time. Therefore the preceding act is important for every player, their decision to act on the next ball will depend on that, their skills, their technique, shot selection and execution. Bowlers on the other hand always need to worry about their accuracy, whether they are spinning the ball, or bowling fast, swinging or just bowling length and line. Fielders on the other hand have different act. They cannot err in catches, misfields, as they don’t know when they will get another opportunity to act. 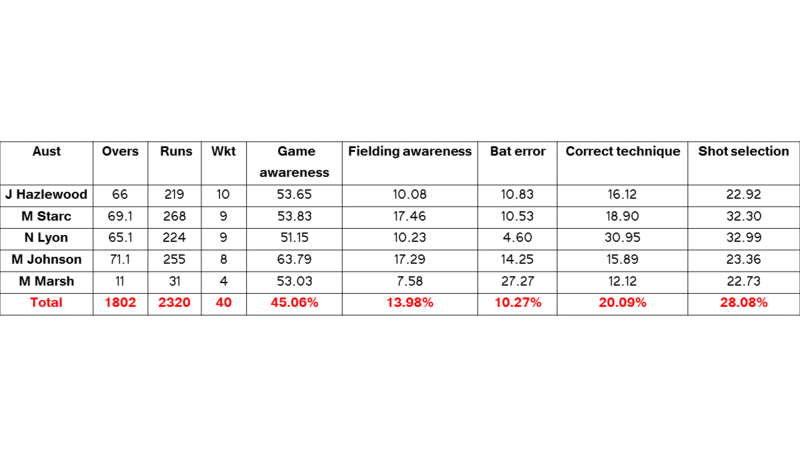 Below is stats analysis of ongoing Ashes series. These indicators reflect some fascinating outcomes. 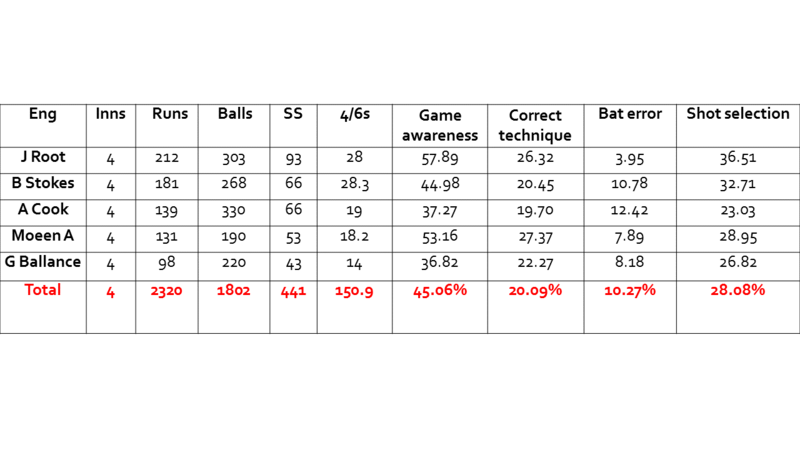 The percentile is divided by number of balls faced – although I have only included the top performer in these tables, but the last row is the team's total(sum of all players). You just booked "Decision making in cricket"